A bombing by suspected Islamic State (IS) militants in Libya has killed at least 40 people and wounded dozens in the eastern town of al-Qubbah. Three bombs exploded, targeting a petrol station, a police station and the home of parliamentary speaker Agila Salah, a security source told BBC News. According to an online statement, IS fighters said they struck in retaliation for Egyptian air strikes. Egypt launched strikes after IS killed 21 Egyptian Christians it had abducted. The al-Qubbah attack is one of the deadliest in Libya since the toppling of Col Muammar Gaddafi four years ago. The country remains in a state of chaos with two governments vying for legitimacy and territory. Medics at the scene of the bombings said the majority of casualties were at the petrol station, where there was a long queue of motorists. Agila Salah was not at home at the time of the attack, they added. Speaking to Saudi-owned TV channel Al-Arabiya, he announced seven days of mourning for the bomb victims. "I think this operation was revenge for what happened in Derna," Mr Salah said. On Monday, Egypt bombed targets in Derna, killing between 40 and 50 people, according to a Libyan air force commander. The Derna link was confirmed by a statement released by the IS-affiliated group in Libya, which said the attacks targeted an "operations room" used by Libyan military chief General Khalifa Haftar. "This is a message to anyone who is tempted to attack the soldiers of the caliphate [IS] or any Muslim," the statement said. Al-Qubbah lies on the road between Bayda, seat of the official Libyan government, and Derna, which is largely controlled by the Libyan affiliate of IS. The kidnapped Egyptian workers, all Coptic Christians, were seized in separate incidents in December and January from the coastal town of Sirte in eastern Libya, which is under the control of Islamist groups. Islamic State described the Copts it killed as "crusaders". Libya has been wracked by unrest since the 2011 overthrow of Gaddafi. Since then numerous militia groups have battled for control and the country has two rival governments and parliaments. The internationally recognised parliament is based in the eastern port of Tobruk, from which Mr Salah reportedly spoke to Al-Arabiya on Friday. A rival parliament and government are based nearly 1,000km (620 miles) to the west in the capital, Tripoli. 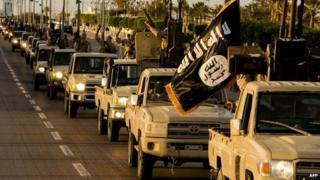 To the east, the city of Benghazi - where the 2011 revolution began - is now largely in the hands of Islamist militants.